Updated Greenwood Home w/ Breathtaking Mtn. Views! Enjoy all the modern comforts of home and retreat to a mountain destination at this 3-bedroom, 2.5-bathroom vacation rental home, which comfortably sleeps 10 in Greenwood. This chalet-style home was renovated in 2019 and rests atop a hill overlooking the beautiful South Pond and Mahoosuc Mountain range. The well-appointed, 2,100-square-foot living space, gorgeous porch views of Mt. Washington and Mt. Abram, and easy access to endless outdoor recreation provide an ideal Maine forest getaway! 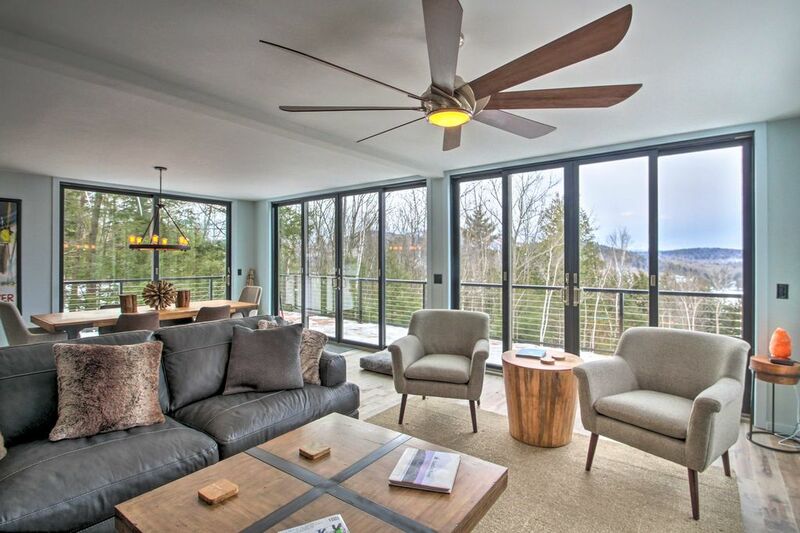 An open-concept layout, floor-to-ceiling windows, and incredible views of the Mahoosuc Mountain Range, South Pond, and Mount Washington welcome you inside your newly-renovated Greenwood vacation rental! Make all of your meals in the fully equipped kitchen which offers new stainless steel appliances and bar seating surrounding the granite countertops. Guests can bring their own K cups for the home's available Keurig coffee machine and collaborate with the whole family as you experiment with new recipes! Set your food on the new dining table that comfortably seats 10 and share memorable dining experiences while enjoying mountain views from the back porch windows. Unwind after your meals and relax on the living room’s comfortable sectional couch and 2 armchairs, throw on the gas fireplace and cozy up with your favorite movies on the mounted 65" 4K HD flat-screen TV - equipped with Netflix for even more entertainment options. Downstairs, you'll find a second family room in the finished basement that features a full sectional sofa, 2 chairs, and a flat-screen TV. The recently-finished basement is a full walkout with views, a bedroom, and a full bathroom! On pleasant evenings, step outside to the expansive back porch with your favorite beverage and enjoy a majestic sunset over the Mahoosuc Mountain Range. Once the sun fully sets in the winter, you can see distant lights from night skiing at the Sunday River Ski Resort. When you’re ready to call it a night, drift off to a quiet, uninterrupted sleep in one of the comfortable bedrooms. Wake up and enjoy a refreshing shower to prepare for your next adventure! Depending on the season you plan your stay, you’ll have great access to many opportunities for exciting outdoor recreation in the area, including locations for hiking, skiing, golfing, ice fishing and snowmobiling. Bring your boat and water equipment, as both North and South Pond rest right against the home and offer full boat access. You can also make an easy drive to Lake Christopher, under 1 mile from the home. If you’re traveling in the winter and wish to ski, simply drive 4 miles to Mt Abram. If you're up for a slightly longer trip, head to Sunday River Ski Resort - which also has night skiing opportunities! When you’ve had your fill with outdoor adventures, finish your vacation by treating yourself to a day out in downtown Bethel, just a short and scenic drive from your front door. Grab brunch at Cafe Di Cocoa, refuel with an afternoon drink at Sud’s Pub, then enjoy a comfort-food dinner at Brian’s! - Great Greenwood location - Situated atop a hill with breathtaking mountain and pond views, this property offers easy access to endless outdoor recreation and the quaint Bethel downtown area. Just got back from spending the weekend at this place, the house was so nice and roomy even with 10 people and dogs! The views from the deck were amazing, and the weather was perfect for a snowboarding weekend. Everything in the house was new and immaculate, and we loved how secluded it was but still so close to the main road. The owner of the property also answered my texts immediately when I had questions. We had a great time and will definitely be back!! We had a great stay in Greenwood. Beautiful setting, lots of space to spread out, modern kitchen and furniture. Nice neighborhood to walk around in and easy drive to get to ski resorts in the area. We really enjoyed our stay at this home. We skied Mt Abrams during a stormy weekend, but the house was always warm and comfortable. The recent renovations put this home in a league of its own with floor to ceiling glass to enjoy the lake views and an open floor plan to ensure time with family can remain a priority. Wonderful house with a lot of character and activities to do. This was a great location and perfect view of the lake. The property was nice with plenty of room. There was only two of us, but this rental could hold 4 more people and have plenty of room. We stayed in August and the temps were in the high 80's and 90 degrees. So the biggest draw back to this rental is no ac.. We were out during the day, but at night it never cooled have and it made for an uncomfortable night trying to sleep. The screen door did not latch all the way and there was a gap at the top. If we left it open bugs would get in. So we could not leave it open for air circulation. This rental would do well to invest in a few window units. At least this would take some of the edge off as far as the heat build up during the day. We loved Maine and will come back. But if we come back in the summer we will make sure to locate a rental with an ac option. The cabin was beautiful and the view is even better in person!! The house is very nice and comfortable. The directions given are perfect. My only complaint was that the house wasn't very clean when we got there. I did have to sweep the floors and they were very dirty. Oh yeah and the very noisy, scary fishercat at night that kept me up!! !